Washington, DC (Oct. 20, 2015) — As our shared goal is to save the most lives possible from breast cancer, the American College of Radiology (ACR) and Society of Breast Imaging (SBI) continue to recommend that women get yearly mammograms starting at age 40. New American Cancer Society (ACS) breast cancer screening guidelines, and previous data used by the United States Preventive Services Task Force (USPSTF) to create their recommendations, state that starting annual mammography at age 40 saves the most lives. “The ACS has strongly reaffirmed that mammography screening saves lives. The new ACS guidelines show that if a woman wants to reduce, as much as possible, her risk of dying of breast cancer, she will choose yearly mammography starting at age 40. A recent study in the British Medical Journal confirms this, showing that early detection of breast cancer is critical for improving breast cancer survival, regardless of therapy advances. Moving away from annual screening of women ages 40 and older puts women’s lives at risk,” said Debra Monticciolo, MD, FACR, chair of the American College of Radiology Breast Imaging Commission. The ACR and SBI agree with the ACS and others that overdiagnosis claims are vastly inflated due to key methodological flaws in many studies. Overdiagnosis is likely 1 to 10 percent — largely due to inclusion of ductal carcinoma in situ (DCIS). Few, if any, invasive cancers are over-diagnosed. ACR and SBI also agree with the ACS that the vast majority of the 10 percent of women asked to return following an inconclusive mammogram (often termed a “false positive”), simply get another mammogram and/or an ultrasound for clarification. 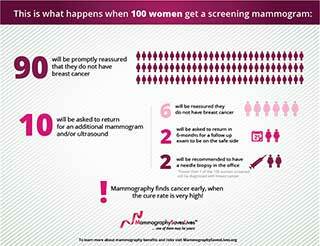 Only 1 to 2 percent of women have a needle biopsy as a result of a screening mammogram (see risks infographic). Short-term anxiety from test results, though normal, is shown to have no lasting effects and does not outweigh the 35 percent reduction in breast cancer deaths and thousands of lives saved each year by mammography screening. “Published research shows that nearly all women who experience a false-positive exam endorse regular screening and want to know their status. The ACR and SBI agree with ACS that women 40 and older should have access to mammograms. We also recommend that women, 40 to 45, get screened and would expect that mammography critics would agree that Medicare and private insurers should be required to cover women 40 and older for these exams,” said SBI President, Elizabeth Morris, MD, FACR. While ACS states that transitioning to biennial screening is an option for older women, they note that either one or two year intervals would be appropriate as a woman ages. The ACR and SBI strongly encourage women to obtain the maximum lifesaving benefits from mammography by continuing to get annual screening. The ACR and SBI commend ACS for using the modern IOM guideline development process — which is more trustworthy than the antiquated USPSTF methods. The ACS performed an extensive evidence review, including randomized control trials, population-based observational studies, case-control studies and cohort studies. This goes beyond the USPSTF limited review of only selected studies that underestimate the lifesaving benefit of mammography screening. Many of those studies were decades old and used what would now be considered outdated equipment. The ACS included individuals on its panel who have experience in breast cancer and sought input from breast cancer experts. The USPSTF methodology lacks transparency, has limited input from cancer experts and does not engage all stakeholders which are needed to form meaningful and trustworthy guidelines.